It is quite a daunting process understanding real estate education regulations in South Africa, and the set qualifying process. We are going to do our best to set this out for you in a way that you can easily understand the steps, and why they have been implemented. Prior to 2008 estate agents were required to write an exam set by the EAAB, and that was it. The EAAB was formed to regulate the conduct of estate agents. The EAAB was established in 1976 in terms of the Estate Agency Affairs Act 112 of 1976 (‘the Act”), with the mandate to regulate and control certain activities of estate agents in the public interest. South African Qualifying Association (SAQA) is the body that issues qualifying certificates from school to Doctorates. ServiceSETA (SSETA) falls under SAQA and controls the NQF4 and NQF5 real estate qualifications. Here is a high-level overview of each step. Should you want additional or detailed information about any aspect of the process, simply click on the links provided. Receive your Fidelity Fund Certificate (FFC). Start your intern logbook. This must be completed in 12 months. Click here for details of how PropAcademy can help you to meet this deadline. If you miss the deadline, you may find yourself facing disqualification, having to start all over again. You can check your due date for submission of your logbook by logging in to the EAAB portal and clicking on “Qualification Status”. To become a full status real estate agent, you must be competent in the outcomes-based NQF Level 4 Real Estate requirements as set out by the SSETA and be found competent in your PDE4 exam. Check whether you qualify for NQF4 exemption. Click here to check your qualification against the EAAB Matrix. If you think you qualify for exemption, apply for this (this can take two months). If you choose the 3 month RPL course or the full 6 month course, but you do not have grade 12 mathematics and a second South African language then you will need to register and complete the bridging courses. To become a Full Status estate agent, you must write and pass the EAAB’s PDE4 exam. This is a 4-hour open book exam written through the EAAB. Check the next exam date by clicking here. Bookings for this exam open 6 weeks prior. As soon as you receive your NQF4 competency certificate from SSETA, book for your PDE4 exam with the EAAB. Brush up on the knowledge you will require to pass the exam, this course has maintained it’s 100% pass rate. Write and pass this exam. Go out and celebrate – you are now a Full Status Estate Agent! To maintain your status, you will need to earn CPD points. Click here for details about the CPD process and complete your non-verifiable CPD points online by registering here. To become a Principal Property Practitioner, you must be found competent in NQF5 Real estate. You do not have to have written your PDE4 exam to begin your NQF5 studies, however this exam must be completed. To start your NQF5 studies you must have completed your NQF4. Check whether you qualify to be exempt from NQF5. Click here to check your qualification against the EAAB Matrix. If you think you qualify for exemption, apply for this (this can take two months). Your journey is coming to an end. Armed with your NQF5, you have just two years to write and pass your PDE5 to maintain your Principal Status. Bookings for this exam open 6 weeks prior. Check the next exam date by clicking here and book your seat through the EAAB. Brush up on all your real estate knowledge to sit for the four-hour PDE5 exam. Our 100% pass rate is still intact. To make it a little easier for you to keep track of the qualification process, we’ve put together this handy infographic which you are welcome to download, print and share. Click the image above to download and save it to your computer or print it out so you can refer to it at any time. Hint: Read our blog – it contains interesting hints and tips. 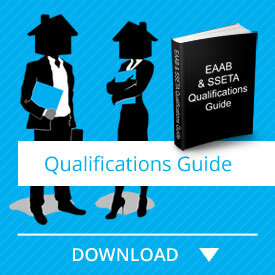 For more detailed information, download our eBook “Estate Agents Affairs Board (EAAB) & ServicesSETA (SSETA) Qualification Guide”. We hope this makes the EAAB & ServiceSETA qualification process for real estate agents a little easier to follow, but if you have any questions, please post them in the comments below or contact us and we’ll gladly assist you on your path to becoming a qualified estate agent. And if you found this guide helpful, please like and share it with your friends and colleagues. Hi Thokozile, thank you for your comment. That is perfect, we currently facilitate classes there. Please click on the contact us page and send us your info so we can plan your training.